How do I create a new subdomain? 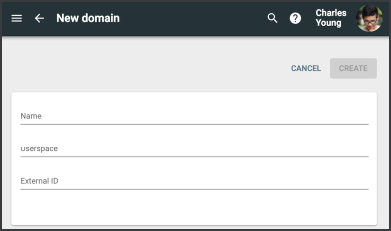 Open the Domain tool from the Main Menu, and click Subdomains in the tabs bar. Name as you want it to appear for users in the app (required). Userspace, which becomes the first part of the subdomain's URL: [Userspace].agilixbuzz.com (required). External ID, which is any ID needed to align the subdomain with an external program or application (optional). To delete a subdomain, check its box on the Subdomains screen and click Delete; check multiple boxes to delete more than one at a time. To create a subdomain within a subdomain, click the Domain ID and follow the same process outlined above. Hi! I'm trying to create a subdomain to put graduated students, but I get an error message: "Unable to create domain." See screenshots below. It looks like I have all the Domain Permissions, so what am I doing wrong or missing? The userspace (login prefix) may only contain alphanumeric characters and dashes, may not start or end with a dash, and must contain an alphabetic letter somewhere. In other words, you cannot use an underscore in your userspace. How do I create and manage my domain courses?